As a result of diverging interests, long-time band member Mick Wilson has left 10cc to pursue other projects. He is replaced by Iain Hornal who has worked with 10cc on several occasions when Mick was unavailable. Iain supported 10cc on its last UK tour and is a key member of Graham Gouldman’s Heart Full of Songs band, which toured the UK in October. 10cc returns to live shows in March with five concerts in Germany, eight in Holland and a 12-show tour of Australia in April, summer festivals in Europe and a UK tour being planned for the autumn. ”Mick has been a friend and a valued member of the band for many years and I wish him all the very best for the future,” says 10cc’s Graham Gouldman. 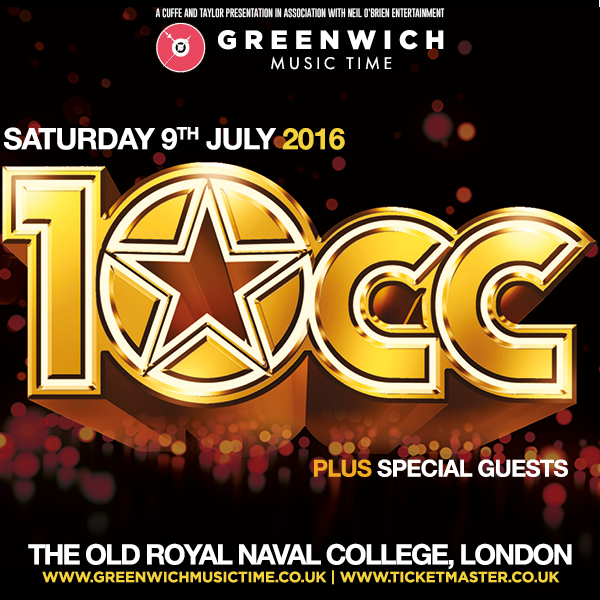 We are coming to the end of a most incredible year for 10cc. We have travelled extensively and played more gigs in one year than I can ever remember, and 2017 is shaping up to be more of the same. Bring it on. I’d like to take this opportunity on behalf of the band to thank all our fans, young, and not so young, for your continued support and we all look forward to seeing you in 2017, wherever you are in the world. Have a great Christmas/Chanukah and a happy and healthy new year. Tickets for the 10cc Spring Tour 2017 are available on “presale” to 10cc Fans now via Ticketline. Among the most inventive and influential bands in the history of popular music, 10cc are one of the very few acts to have achieved commercial, critical and creative success in equal measure, with their current live incarnation still able to sell-out major concert halls. Testament to 10cc’s ongoing appeal, the band can count an array of fellow artists – from Chrissie Hynde and Axl Rose to The Feeling’s Dan Gillespie and Sophie Ellis Bextor – among their many millions of fans. With eleven Top 10 hits, including three No 1s – Rubber Bullets, I’m Not In Love and Dreadlock Holiday – it’s no surprise the band has sold 15 million albums in the UK alone. Paul has worked with 10cc from the beginning and Rick joined the live band in the mid-‘70s. Don’t miss out on your chance to see the band live at the following locations March and April 2017. 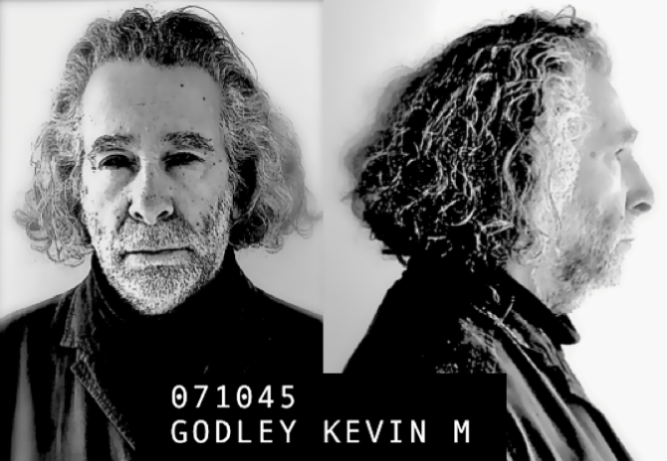 Please check out Kevin Godley’s new website, with a lots of great content about him & 10cc. 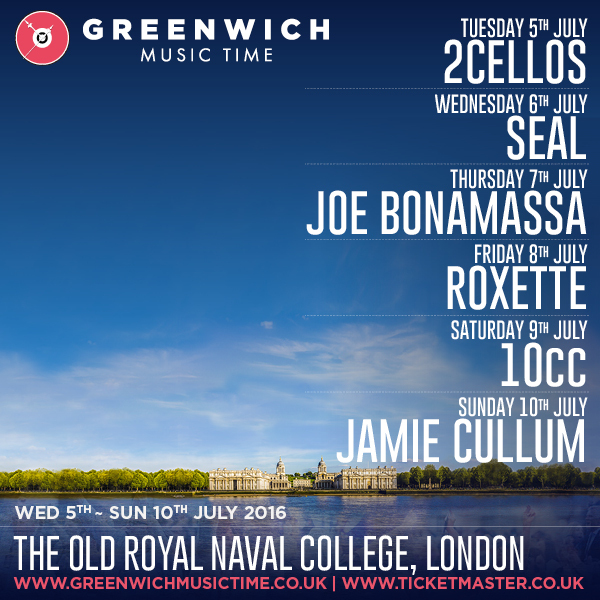 10cc plus special guest to play live at The Old Royal Naval College, London. We played at the Hop Farm festival last Friday, July 1st. The set was going great, but we got a nasty surprise during ‘Rubber Bullets’ when all the power went off. Unfortunately the back up generator also broke down. Undeterred we waited for about five minutes at the side of the stage until power was restored. We went back on-stage to rapturous applause and carried on with ‘bullets’ from where we were so rudely interrupted. A fab day was had by one and all.